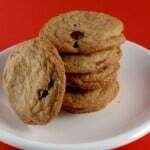 One of my readers sent me a chocolate chip cookie recipe to convert. 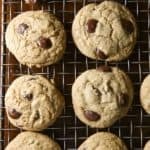 After taking one look at the recipe, I realized it was the famous “Perfect Chocolate Chip Cookie” recipe from Cook’s Illustrated magazine. However, Carol’s recipe was the original version. They’ve since updated it to use browned butter and her’s didn’t include it. 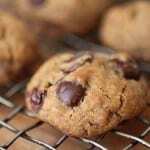 When made with wheat flour, this recipe makes chewy chocolate chip cookies. 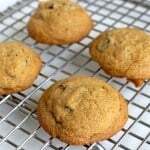 After converting the recipe, my cookies were not chewy or soft or tender. They were undoubtedly crispy. I was bummed. Then a funny thing happened. I brought a plate of them to my mom’s workplace and people gobbled them up. “But they are all wrong,” I kept thinking. Only they weren’t. They might not have the chewy texture I was looking for but, as is, they are delicious. And I couldn’t keep a delicious chocolate chip cookie recipe to myself, could I? Since the recipe uses melted butter, I don’t use an electric mixer to make the dough. I stir it together with a wooden spoon. If you’d prefer an electric mixer, go ahead and use one! I’m still working on a chewy chocolate chip recipe for Carol. 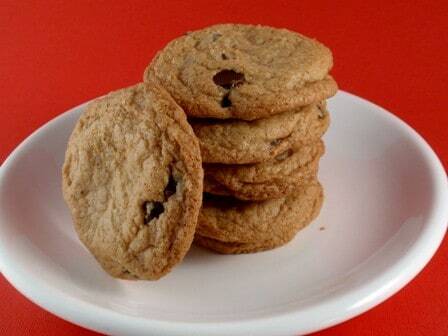 Until then, enjoy these crispy chocolate chip cookies! Whisk together white rice flour, sweet rice flour, cornstarch, baking soda, and salt in a small bowl. Combine melted butter, sugars, egg, egg yolk and vanilla extract in a large bowl. Stir until smooth. Add the flour. Using a wooden spoon, stir together until a dough forms. Add chocolate chips and stir until just combined. Drop dough, about 2 teaspoons each, onto prepared cookie sheet. Bake for 15-18 minutes or until golden brown. Cool cookies on a wire rack. 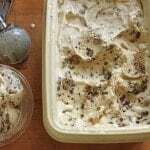 Store in an airtight container for up to five days.